Introduction: Up to 26% of pleural infections have no pathogens identified using standard microbiological and genetic amplification techniques. Possible explanations for this phenomenon include previous use of antibiotics, microbiologically different pleural fluid locules, or difficulty isolating organisms using conventional techniques. Pneumocystis jirovecii (previously carinii) causes pneumonia in immunocompromised hosts. Previous studies have demonstrated an asymptomatic carrier state in immunocompetent individuals—P jirovecii DNA was detected in the bronchoalveolar lavage fluid of 18% of patients with lung disease, 4.4% with bacterial pneumonia (both without HIV) and in the oropharynx of 20% of healthy individuals. We hypothesised that P jirovecii may account for some microbiologically obscure pleural infections and that co-infection with P jirovecii and bacteria may occur in pleural infection. The aim of this study was to assess the prevalence of P jirovecii in pleural infection, using highly sensitive and specific genetic detection techniques. Methods: Pleural fluid was obtained from participants in the MIST1 trial (a double-blind, placebo-controlled trial of intrapleural streptokinase in pleural infection). Criteria for pleural infection were purulence, culture positivity, Gram staining positivity, or pH below 7.2, with clinical evidence of infection. Samples from 100 patients (randomly selected from 454 patients recruited) were analysed using highly sensitive real-time PCR targeting part of the P jirovecii heat shock 70 (HSP70) gene sequence. Potential inhibition of P jirovecii HSP70 PCR was assessed by the use of the SPUD assay. Results: There was no evidence of P jirovecii DNA in any sample. Samples with possible inhibition of PCR were diluted and retested; these samples remained negative for P jirovecii DNA despite recovery of the SPUD amplicon. Conclusions: Having given consideration to the possible inhibition of PCR, there was no evidence of P jirovecii DNA in any sample using the highly sensitive real-time HSP70 PCR technique. Therefore, P jirovecii is neither a common pathogen nor co-pathogen in those with pleural infection, an important negative finding given its prevalence as a co-pathogen in pneumonia. There is no need to investigate for P jirovecii, nor for its blind treatment, in pleural infection unless a patient is severely immunocompromised. Introduction: In patients presenting with lung cancer, pleural involvement has significant implications on disease staging, prognosis and treatment. Computerised tomography (CT) is significantly more sensitive than plain radiographs in identifying pleural effusions but the prevalence of pleural effusion detected by CT in patients presenting with lung cancer is unknown. Aims: To determine the prevalence of pleural effusion on CT in patients presenting with lung cancer and during the subsequent disease course. To identify factors associated with the presence of pleural effusions. Method: Retrospective review of 200 consecutive patients presenting to two UK hospitals. Results: Pleural effusions were common. CT scan was more sensitive for detecting pleural effusions than chest x ray (CXR), detecting an effusion in 50 (25%) versus 27 patients (13.5%), respectively (p<0.001, McNemar test). 16 (32%) were cytologically confirmed to be malignant. A further 11 (5.5%) patients developed an effusion as their disease progressed, giving an overall prevalence of 30.5%. Patients with small-cell lung cancer (SCLC) were more likely (relative risk 1.8, p = 0.026) to develop an effusion. Age, gender, and location of the tumours were not predictive of the presence of pleural effusions (see table). All patients with SCLC and a pleural effusion had extensive disease. Conclusion: Pleural effusions are common in lung cancer and usually present at diagnosis. CT is a more sensitive test for their presence than CXR, with a detection rate of 25% at diagnosis. Investigations to establish whether effusions are malignant or paramalignant in origin are undertaken infrequently. P162 DO NON-STEROIDAL ANTI-INFLAMMATORY DRUGS DECREASE SUCCESS OF TALC PLEURODESIS? Introduction: Talc slurry pleurodesis has a reported success rate of over 80%. Our impression was that in clinical practice we were not achieving this. We audited our recent pleurodeses to see if this was the case and what factors may have influenced the success of the procedure. Methods: Between January 2005 and June 2007 we identified 28 patients who underwent a total of 40 pleurodeses. We audited our practice against BTS guidelines and looked at what factors may have influenced outcome. Success was defined as the absence of significant reaccumulation of fluid within the first 3 months post-pleurodesis, excluding patients who did not survive one month. Results: The median time to reaccumulation was 27 days (mean 74.9, range 2–600) and to death 65 days (mean 136, range 1–780). Nine patients died within 1 month, two were lost to follow-up. Of those who survived a month, the 3-month success rate was 10 of 29 (34%). The site of the primary, the grade of the requestor, the number of previous pleurodeses attempted and the chest x ray appearances prior to pleurodesis had no significant association with success rates. Drainage rate <150 ml/day pre-pleurodesis and suction post-pleurodesis did not affect success rates. One of nine patients who were on steroids were successful compared with nine of 20 who were not on steroids (p = 0.107 by Fisher’s exact test). None of the eight patients on non-steroidal anti-inflammatory drugs (NSAID) were successful compared with 10 of 21 patients who were not on NSAID (p = 0.0265 by Fisher’s exact test). Discussion: The high early death rate and the low success rate suggest we are pleurodesing patients with more advanced disease than those in previous studies. Better identification of those in the terminal phase of their illness is required. Despite the small sample size, NSAID were significantly associated with pleurodesis failure and there was a non-significant trend against steroid use. This may be due to confounding factors as patients on these drugs are likely to have had more advanced disease. However, animal studies have demonstrated similar findings. Consideration should be given to using alternative analgesia during pleurodesis. Introduction: Exudative pleural effusions (EPE) are common and are associated with sinister pathology. Timely, thorough investigation into underlying aetiology is therefore essential. Current British Thoracic Society (BTS) guidelines include a diagnostic algorithm for the investigation of unilateral effusions. A retrospective audit of the management of EPE in a large district general hospital against BTS guidelines revealed deficiencies in the diagnostic pathway, resulting in low diagnostic rates compared with published data. We subsequently established a specialist pleural effusion clinic (SPEC) and prospectively audited the management of EPE in the clinic’s first year. We report on comparative data from the two audits. Methods: The retrospective cohort consisted of cases identified from clinical coding over an 18-month period. Their clinical records were reviewed and data from 100 patients with confirmed or likely EPE were analysed. 75 new patients were seen in the SPEC in the first year. Patients were referred from general practice (n = 25), general medicine (n = 17) and other specialties including oncology (n = 8). 25 of those seen had a diagnosis at referral and were therefore excluded. Data on the SPEC cohort was collected prospectively. Results: The mean age of the retrospective cohort and the SPEC cohort was 68 years and 65.8 years, respectively. 50% (50/100) of the retrospective cohort had chest physician input compared with all of those in the SPEC cohort. 26/100 (50%) of the retrospective cohort had all recommended investigations on the first pleural tap. This is compared with a rate of 30/50 (60%) in the SPEC cohort (100% when first tap was in SPEC). An underlying diagnosis was confirmed in 26/100 of the retrospective cohort compared with 44/50 (88%) of those seen in SPEC. The pleurodesis rate in appropriate patients was 3/7 in the retrospective cohort and 7/7 in the SPEC cohort. Median length of inpatient stay was 12 days (range 1–55) in the retrospective cohort and 1 day (range 0–272) in the SPEC cohort. Conclusions: In a district general hospital setting we have improved adherence to BTS recommendations using a SPEC. We achieved a higher diagnostic rate and decreased the inpatient bed day requirement. In May 2008, the National Patient Safety Agency strongly advised the use of ultrasound when inserting a chest drain for fluid. Increasingly, portable ultrasound machines are becoming available for use by clinical teams across the hospital. The aim of this project was to establish to what extent these are available and being used by A&E, medical and respiratory teams for guiding chest drain insertion. A telephone survey was conducted, interviewing a junior doctor working in each of the A&E, medical admissions and respiratory departments in all training hospitals across the Thames region (this represents 168 clinical teams in 58 hospitals). This was performed over a one-week period in July 2008. Portable ultrasound machines were accessible for use by A&E clinicians in 60% (33/55) of A&E departments. However, they were only used to assist with guidance of chest drains in five of these 33 departments (15%). The anatomical approach was suggested as the most common approach used in A&E (88%). A&E clinicians commented in 15 hospitals (27%) that they would refer the patients to the medical team rather than insert the drain themselves (see fig). 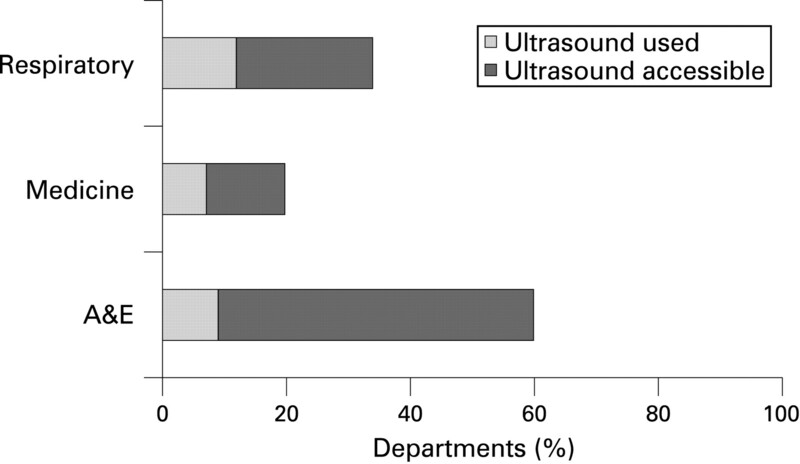 Portable ultrasound machines were accessible for use by medical juniors in 20% (11/55) of hospitals; however, they were only used for drain insertion in four hospitals (with involvement of the respiratory team in all cases). In the remaining hospitals, if ultrasound was needed, input from the radiology department was required (93%). Only three departments (5%) had a policy to use ultrasound guidance for all cases. In respiratory departments, doctors had access to portable ultrasound in 34% (20/58) of hospitals and this was utilised for drain placement in seven hospitals. Only four departments (7%) had a policy to use ultrasound guidance for all cases. 44 of 168 (26%) doctors could identify their training lead for chest drain insertion. In 77% of cases, this was a member of the respiratory team. This survey documents that across the Thames region, the use of ultrasound in chest drain placement is not routine current practice. Even when portable ultrasound is available clinicians are still relying on an anatomical approach as first line. Abstract P164 Figure Accessibility and use of portable ultrasound for the placement of chest drains for pleural fluid. Background: Pneumothorax is common in patients with cystic fibrosis (CF). It is often treated with autologous blood patch pleurodesis (ABPP) as it is well tolerated and has less impact on transplantation. However, its effectiveness has never been adequately assessed in the treatment of secondary spontaneous pneumothorax. In our study we look at CF patients with spontaneous pneumothorax who were treated with this procedure to determine the efficacy and any complications. Methods: Retrospective analysis of patients with CF who presented with pneumothorax between January 1993 and January 2008. We looked for recurrence and any complications with the procedure. Results: We found a total of 17 patients with pneumothorax who were treated with ABPP, three patients who only had intercostal chest drain and another two who were treated with talc pleurodesis. The time period for observation for recurrence varied from 6 months in the case of the most recent admission to 15 years. All 17 patients had large (>2 cm) symptomatic pneumothorax on admission. Of these, six (35.2%) patients had a recurrence of pneumothorax on the same side, four within 6 weeks, one 13 months and one patient 17 months later. One recurrent patient presented with tension pneumothorax and was treated with talc pleurodesis with no subsequent recurrence. The remaining five patients were treated with repeat blood pleurodesis and three had no further recurrence over the next 2 years, two had another recurrence and were then treated with talc pleurodesis with no further recurrence. There were no immediate complications in any of the patients and none developed pleural infection, which has been reported in previous studies. Of the three patients who were treated with chest drain alone, two had recurrence within 4 months and were treated with blood pleurodesis with no further recurrences over the next 2 years. The two patients who were treated with talc alone did not have any recurrence afterwards. Summary: Autologous blood patch pleurodesis appears to be a well tolerated and safe procedure that is useful in patients who may later be candidates for lung transplantation. However, it does not appear to be as effective as talc in preventing a recurrence.